eBay's efforts to break down what it sees as a barrier to fair online trade have not had the effect the company was seeking. Rather than lessening the restrictions brand owners can put on the sale of their items, as eBay hoped, a recent ruling by the European Commission upholds their right to determine who can and can't sell their goods—and even where. 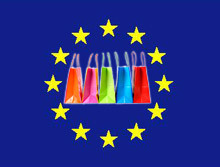 In the EC's latest version of its European Union rules—which regulates the sale of online goods for sellers based in Europe—the organization throws online resellers a bone, saying distributors of branded merchandise should be able to sell more items online as "they see fit." At the same time, however, officials want brand owners to have a say in who may sell their products. Currently, owners of brands can specify this and prohibit sellers from offering their products online altogether. The announcement should please well-known companies, analysts say, since high-end brands worried that changes to the current regulations could undermine their names. "Selective distribution, whether real or virtual, has always been fundamental for luxury brands," Andrea Ciccoli, a fashion industry analyst for Bain & Co. in Milan, tells reporters. "Not just anyone can sell products by Chanel and Prada in stores—and there's no real reason why they should be able to on the Web. It would be like giving people a license to print money." According to the proposed changes, brand owners would be able to require online merchants to sell a certain number of their items in brick-and-mortar shops if they offer them online. This would prevent e-merchants from taking advantage of the promotions brick-and-mortar shops do for their goods, the commission notes. But once that requirement is fulfilled, suppliers can't limit the amount of brand-name items sold online, which will help more goods go online. eBay says consumer interest should be the top priority, not brands. The company recently launched a petition drive to try to sway lawmakers. Adjustments to the laws are not yet final and people have until Sept. 28 to chime in on the proposed changes. Modifications are slated to take effect next year. Ask Auctiva: Why No News on AucCom?